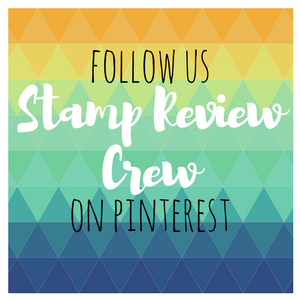 The Stamp Review Crew has a special Bonus Hop for you today. We could not resist sharing our love for the Thoughtful Branches bundle! 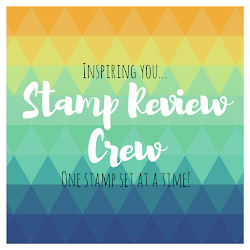 When I saw the limited time bundle that Stampin' Up! is offering for the month of August, I knew I had to have it. It is so very versatile, and who can resist those sentiments?! Oh, wait, you maybe haven't seen it yet ;) Trust me, you are going to love it! 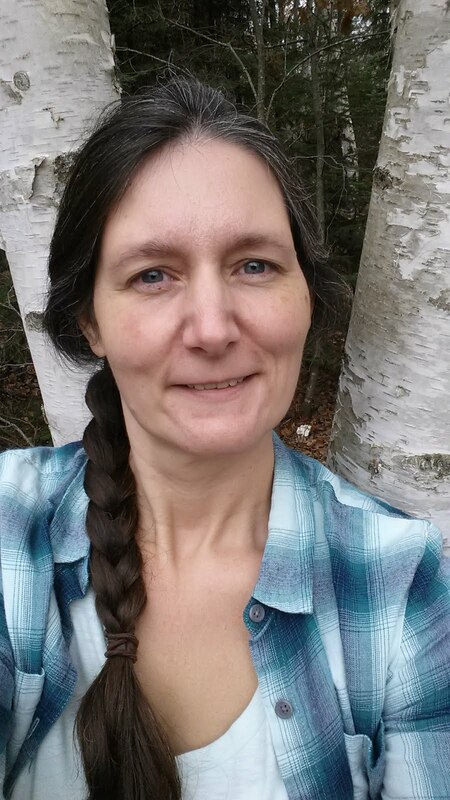 If you are following along in order, then you just arrived from Sue Plote's blog where she will fill you with amazement! 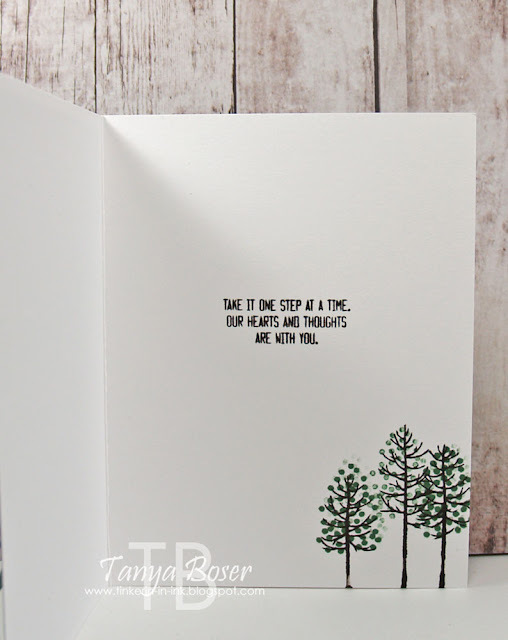 Prepare a 4¼"x5½" Thick Whisper White card base, scoring in half. Cut a Whisper White panel to 4" wide by 3¼" tall, then stamp leaves in Garden Green repeatedly, sometimes not reinking between impressions. Stamp the tree trunks in Early Espresso to the darkest trees only. Cut a Sahara Sand panel to 4"x5¼". Stamp the greeting once full strength, then fill in with stamped-off repetitions of the greeting. Use one of the largest Ovals from the Ovals framelits or the Layering Ovals framelits, put just the lower part of the tree panel under the die on your Big Shot platform, and place the top cutting plate just over the part you want to die cut. 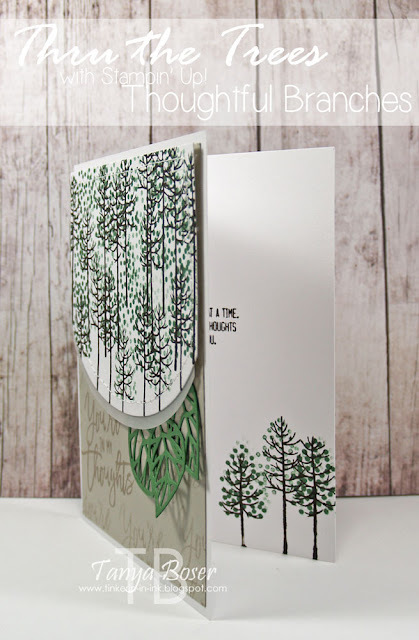 Then run through the die-cutting machine. Cut a piece of Vellum to be 4" wide and at least 1½" tall and repeat. Adhere the vellum to the back of the tree panel, then stitch all the way around the tree panel. Apply dimensionals to the back and adhere to the top of the Sahara Sand panel. 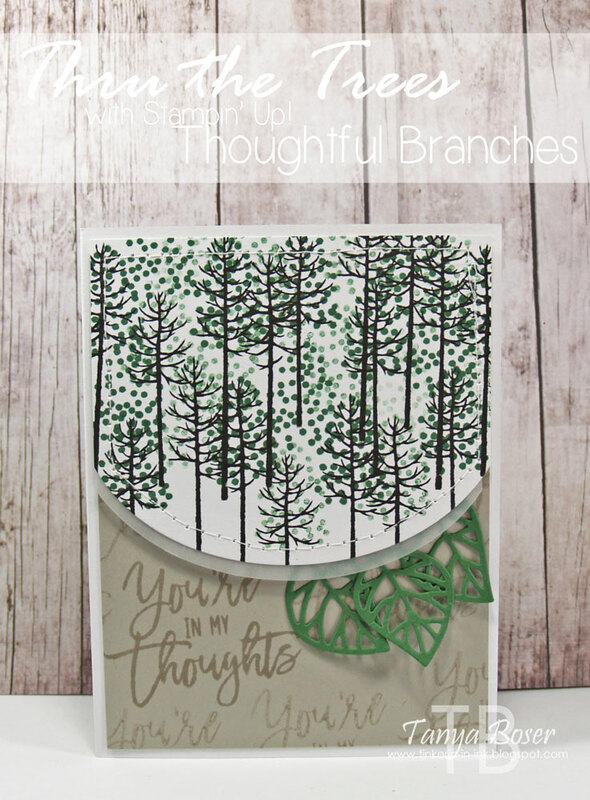 Die cut 2 of the leafy branches from Garden Green using the Precision base plate (this makes life sooo much easier!). Trim off 3 leaves with a bit of stem. Curl them just a bit with your bone folder. Stick to the exposed dimensionals behind the tree panel. Adhere completed panel to the card base. Stamp the second part of the sentiment inside the card in Early Espresso, and add a cluster of trees in the lower right corner. All done! Here is a side view to get an idea of the dimension on the card. Now it is time to go see what wonderment Bruno Bertucci has created for us!